At these prices you can choose a slew of dishes, even share them with another person, and be very satisfied. 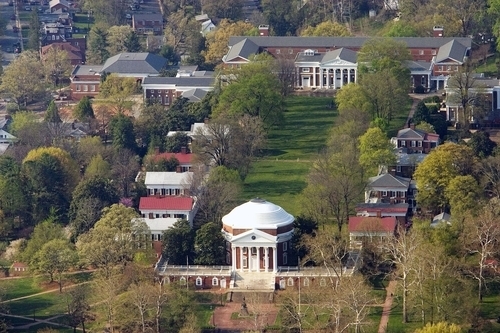 In addition to its illustrious historical record--once home to Thomas Jefferson, James Madison and James Monroe--and one of America's great and most beautiful schools, the University of Virginia (above), the city of Charlottesville has a new reason to boast: Prince William and Princess Kate's new baby girl has been named Charlotte. The colonial Virginia city was named after Queen Charlotte, bride of George III (who, ironically, was the King of England during the Revolutionary War). 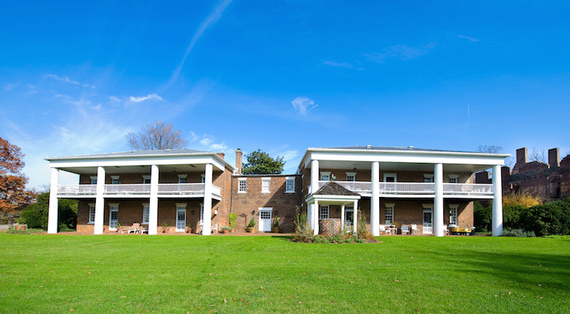 For its Georgian architecture (Jefferson founded and designed several buildings on the University campus) and its proximity to Shenandoah National Park and the Blue Ridge Parkway, Charlottesville draws more than half a million tourists each year, swelled by 20,000 students. All of them can be found strolling the long Downtown Mall lined with restaurants, coffee shops, the Live Arts community theater and the Virginia Discovery Museum. Next month the Festival of the Photograph will be held, followed by the Film Festival in October. On Saturdays, the City Market with its street food eateries is very popular, but downtown is largely undistinguished for upscale dining, catering instead to the student and professor population at places with names like Himalayan Fusion, Jack Brown's Beer & Burger Joint, and Jak-N-Jil. The best restaurants are mostly outside of town, including the Old Mill Room at Boar's Head and Fossettt's at Keswick Hall. I had the happy occasion to dine at a new place with the curious name Parallel 38 (above), which refers to the latitude of Mediterranean countries whose food is featured there. Residing within an upscale shopping center, it is a vast dining hall with a soapstone bar, reclaimed factory cart seating, a beautiful chalkboard mural and a 12-foot walnut table. The intrusive techno music has nothing to do with the Mediterranean theme. 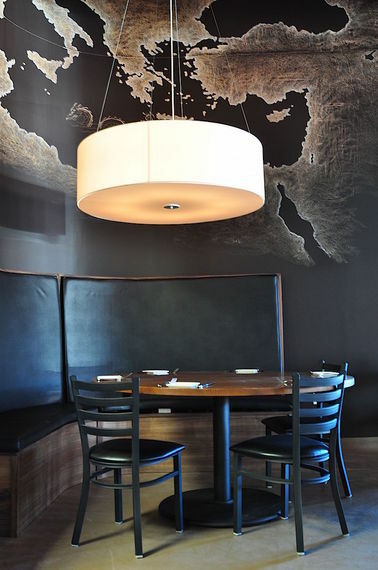 Owner Justin Ross, who'd worked at Zaytinya and Jaleo in DC, is as affable as they come and truly enjoys suggesting an array of small plates, engagingly prepared and plated by Chef Mike Isabella. I was happy to let them choose my meal, which began with fine artisanal cheeses and cured meats from Virginia and Maryland ($6-$9), along with some delectable spreads like Greek htipiti with roasted peppers, feta and thyme ($7) and Lebanese labneh yogurt with zatar spice mixture ($7). Under the menu's Vegetable section there is a delicious, tender gnocchi with a sweet onion soubise, hot peperonata and herbs ($8). Among the meats, I most enjoyed a grilled lamb strip loin cooked in bacon fat with fingerling potatoes and butter blended with a ras el hanout spice mixture ($13) and a roasted pork belly with baby onions, roasted garlic and sumac ($11). Spicy tuna tartare with chili sauce and sesame soy ($11) made for a good seafood selection. For dessert the simple, nicely grainy olive oil lemon cake came with vanilla ice cream. At these prices you can choose a slew of dishes, even share them with another person, and be very satisfied, particularly because this kind of food and design are rare indeed in this area. Also, every wine on the list, even the "Trophy" bottles, are available by the glass at very reasonable prices. Far more traditional in décor is The Ivy Inn restaurant, dating to the 1700s, which is, in fact, just a mile from the University. The red clapboard house with white porch evokes a less hectic era, and the interior, with its draped tables, candlelight, ceiling beams, wood floors and fireplace, has the genteel ambiance of a splendid country home Jefferson would certainly have found congenial. Fairfax County native Angelo Vangelopoulos sources all he can from local farmers for his kitchen larder. Thus, while you can find down-home favorites refined by focused technique like the shrimp and grits with a country ham butter sauce and crispy onion rings ($11) and a lustrous tomato pie ($8), there are also global dishes like his sheep's milk ricotta gnocchi enriched by red wine-braised duck, wild mushrooms and roasted garlic jus ($10/$18), as well as ravioli stuffed with roasted eggplant and ricotta ($8/$15), a dish overelaborated with Portobello Bolognese sauce, spinach, mascarpone cream and Parmigianino. A bison hanger steak ($28) was perfectly cooked medium rare and came with assertive horseradish-flecked scalloped potatoes, sauce chasseur, more wild mushrooms and sautéed greens. The cooking has unusual finesse, evident in the chef's sautéed duck breast with leek-potato cake, a tangy-sweet cherry sauce and sautéed spinach ($28). If you don't opt for the cheese plate ($14) with selections like Goat Lady "Lindale" Gouda from Climax, NC, and the Caramount Red Row from Esmont, VA, you'll thoroughly enjoy pastry chef Kristyne Bouley's sticky toffee pudding with pecan praline and vanilla ice cream ($8) and the well balanced Key lime pie ($8). 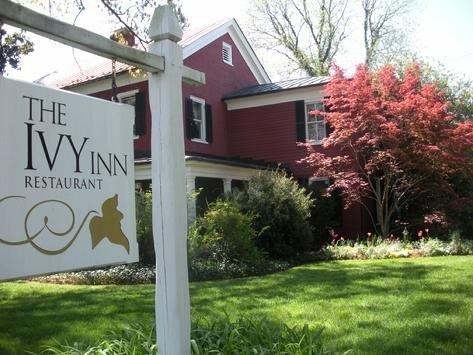 The Ivy Inn boasts one of the area's very finest wine lists, with a few (there should be more) of the ever-improving Virginia wines from estates like Naked Mountain, Akida, Blenheim, and Barboursville. This last estate is the finest of Virginia's more than 250 wineries. Set on 900 acres of rolling hills of the same name, Barboursville (above) it is owned by Gianni Zonin, from Italy's Veneto region, and since 1990 has been overseen by winemaker Luca Paschina, from Piemonte. Together they aim to create wines that shy away from the boldness of California bottlings in favor of a finesse more akin to European examples, which include Italian varietals like Nebbiolo and Vermentino along with Viognier, Cabernet Franc and others. Their finest wine is Octagon ($55), whose name commemorates the octagon drawing room designed for Governor James Barbour's mansion, now part of the estate, by wine-loving Thomas Jefferson, who planted, unsuccessfully, vineyards at his Monticello estate. Octagon is a blend of Merlot, Cabernet Franc and Petit Verdot in the style of France's Pomerol and is made only in optimum years. As Paschina says, "It is harder for a grape to get into Octagon than any other wine in our region." The estate also has an inn dating to 1804, with a number of enchanting rooms that evoke 19th century rural architecture, and vineyard-set cottage suites named after grape varietals. Of course, with accommodations there comes a restaurant, not surprisingly, Italian in its cuisine, offering housemade charcuterie; risotto with fava beans and crispy tripe; roasted game hen with sautéed asparagus, new potatoes and spring onions; and an apricot turnover with crème fraiche ice cream and pistachios. Two courses cost $41, three $47, and four $55, with paired wines extra, if desired. 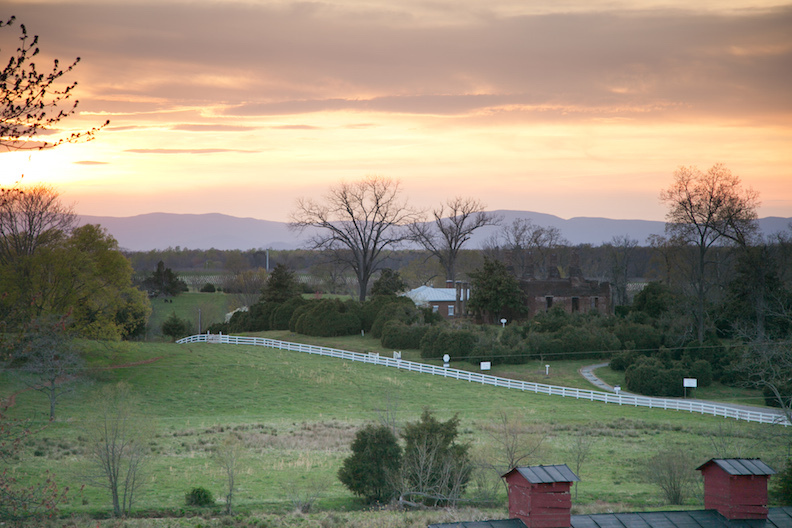 After such a meal at twilight this summer, you walk slowly back to your cottage, crawl under a quilt, listen to the sounds of the farm, and try to stay awake until the stars radiate across the Virginia hills.